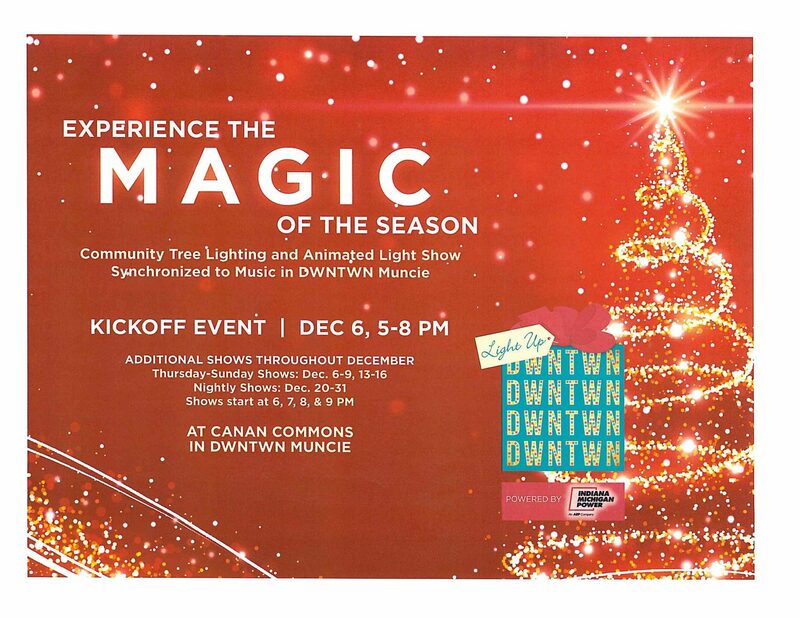 Light Up DWNTWN, powered by Indiana Michigan Power, will be held on First Thursday, December 6, from 5 -8 p.m. throughout Downtown Muncie. Galleries, restaurants and retailers invite you to spend the evening with them as we kick off the holiday shopping season. The Community Tree Lighting ceremony will take place at Canan Commons (located in the 500 block of S. Walnut St.) at 6:00 p.m. Join us as Mayor Dennis Tyler, BSU President Geoffrey Mearns Charlie Cardinal and Santa Claus light up the holiday tree! New this year will be an animated light show synchronized to music! The light show will be executed several times throughout December with times and dates to be announced.